For those of you who suffer from eczema, you can attest to how uncomfortable, at times painful, and annoying it can be. Following my pregnancy, I developed severe eczema on my hands. According to the dermatologist, I have sensitive skin that reacts poorly to dryness typically brought on by water. Well that’s no good…between my excessive hand washing, bottle cleaning, and bath time, limiting water use would be nearly impossible. For the last year, I have tried dozens of lotions and soaps to relieve the eczema: Aveeno, Neutrogena, Neosporin, Cetaphil, the list goes on. Nothing seemed to help. I think I finally found some relief, and both are natural to boot. We are avid Shark Tank viewers. Our Friday nights revolve around the show. A few months ago, a 19-year-old pitched her natural skin scrub, Simple Sugars, claiming that it helped thousands of eczema sufferers, and it was 100% natural–as in safe enough to eat. I was intrigued, but not enough to order a $15 jar online. 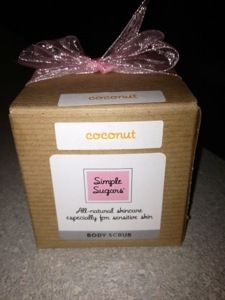 Fast forward to last month when I was grocery shopping at our local Giant Eagle and happened upon a kiosk of natural skin care of which Simple Sugars was in the spotlight. After a demonstration and sample, I decided to give it a try and within just a few days, experienced noticeable improvement. I finished the jar after using it twice a day for about four weeks. I then began using another free sample I received that day called Zum Bar a bar of soap made from goat milk. Again, I started noticing more results after just a few uses; plus its sensitive nature made previously painful hand washing much more bearable. Finally, after each use of the scrub and soap, I use an Aveeno dry skin lotion to help lock in the moisture. My hands are not back to 100%, but after a year of discomfort, I finally feel some relief. If you suffer from the same, maybe it’s worth a try.